Properties in France average 4.6 out of 5 stars. Guest house "the pool house"
Property 18: Guest house "the pool house"
AGRICULTURAL FIELD OF ORGANIC CULTURE - Comfort and absolute calm - Gite "ORANGE"
Property 29: AGRICULTURAL FIELD OF ORGANIC CULTURE - Comfort and absolute calm - Gite "ORANGE"
Property 30: Bed and breakfast in former barn in a typical Catalan village. Dog friendly. 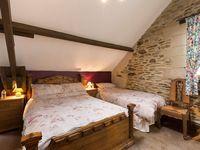 Property 32: Le Mont St Michel , Maison du Montitier, Exclusive B&B Just for you! A wonderful rustic retreat in the south of France, surrounded by vineyards. Property 38: A wonderful rustic retreat in the south of France, surrounded by vineyards. Le Clos d'Othe, Vaumort - Bed and Breakfast Lion "sleep-dream-imagine"
Property 50: Le Clos d'Othe, Vaumort - Bed and Breakfast Lion "sleep-dream-imagine"
Jacqueline was waiting for us upon our arrival. We drove straight from Paris airport to Le mont St Michel. We were exhausted upon our arrival. Jacqueline made us a cup of tea with cookies. It was so welcoming. We had a beautiful view of Le mont St Michel from our rooms and from a short walk to the end of the street. Gorgeous! We were able to walk the next morning down a road and relax after a delicious breakfast prepared by Jacqueline. It was a great place to stay at an old farm and live the experience of old France. This place is awesome!! I loved it! Finding this place by car was a fun &amp; exciting adventure! And the excursion is well worth it! The apartment was spacious, comfortable, newly renovated. Everything works well. It has a spacious Italian-style shower (i.e., overhead, not hand-held sprayer). The bed was great too. Most remarkable: this place is the &quot;Vanta Black&quot; (Google it!) of SILENCE. I have never experienced such complete silence as you'll find here. Remarkable! The hosts are wonderfully courteous and helpful. Very nice people! (Don't miss the excellent breakfast on the veranda with gorgeous views of Provence and the hills.) I definitely hope to return here next year! This region is beautiful! !